You might think that you could just amble into Office Depot or Staples and buy whatever laptop felt right to the touch. But frankly, all the different specs can seem confusing. Really, there are only a few considerations to think about. The PC should have “Intel Core i7” or “Intel Core i5,” which references the speed of the central processor. You don’t need i7 unless you’re a serious gamer, do scientific work, or edit massive movie projects. When we bought a Windows laptop about four years ago, it had i3, which shows how these things have moved along. The new computer should have four to eight gigabytes of RAM (random access memory). RAM is different from storage, which is usually on a hard disk drive. Get the most RAM you can afford. Weight is another big consideration. Lenovo now makes the lightest-ever laptop, the LaVie Z H550. At 1.72 pounds, it’s around half the weight of the three-pound 13-inch Macbook Air, which feels like nothing. 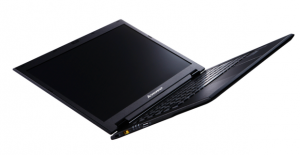 However, at $1300, the Lenovo is also expensive for a Windows machine, and we find a 13-inch screen too cramped. If you’re wondering about a laptop with a touch screen, we say forget it. Using touch is natural on a tablet, not so natural when the screen is perpendicular to you. But it could be useful for a kitchen recipe computer.